A parliamentary report of 1777 recorded parish workhouses in operation at Bordern (with accommodation for up to 8 inmates), Hartlip (10), Iwade (4), Milton (40), Rainham (20), and Sittingborne (25). A pair of cottages on The Street in Borden once served as the parish workhouse. 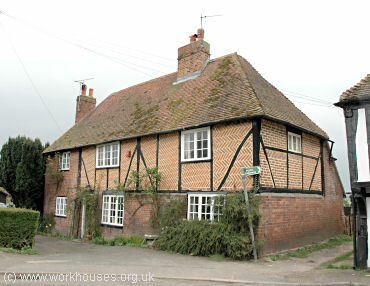 Borden former parish workhouse, 2005. In Bredgar, a house on Swanton Street dating from 1579 was for a while used as the parish workhouse. Bredgar former parish workhouse, 2005. County of Kent: Bapchild, Bobbing, Borden, Bredgar, Lower Halstow, Hartlip, Iwade, Kingsdown, Milstead [Milsted] , Milton (2), Murston, Newington, Rainham, Rodmersham, Sittingbourne (2), Tong, Tunstall, Upchurch. The population falling within the Union at the 1831 census had been 10,689 with parishes ranging in size from from Kingsdown (population 94) to Milton itself (2,233). The average annual poor-rate expenditure for the period 1831-4 had been £11,179 or £1.0s.11d. per head of the population. In May, 1835, there were a number of disturbances in various parts of the union caused by angry paupers who were upset as a result of a reduction in their previous allowances. Members of the Board of Guardians were barracked and stoned, eventually requiring the intervention of police and troops. In 1874, an infectious diseases hospital was erected at the site. It was converted into an infirmary in 1883. The former workhouse buildings were demolished in around 1994 and a housing estate erected on the site. In around 1905, the Milton Union established a home for up 62 girls at Church House, North Street, Milton Regis. The building later became Green Porch children's home. It has now been converted to offices. 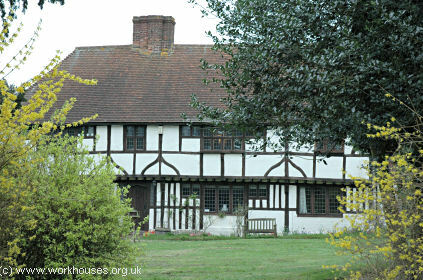 In 1914, a home for up to 45 boys was opened at Langley House, Brewery Road, Milton Regis. The building no longer exists. Milton workhouse — 1881 Census. Milton Union Officers and Staff, 1908. Kent History and Library Centre, James Whatman Way, Maidstone, Kent ME14 1LQ Holdings include: Guardians' minutes (1835-1930); Admissions and discharges (1835-1932); Births (1866-1912); Deaths (1893-1936); Creed register (1888-1914); Register of children in institution (1914-24); Addresses of friends of paupers (1902-28); Vaccination registers (1853-1929); etc.